I’ve never been one to go all out for Valentines’ Day. When I was single it was because I was alone and just wanted the day to get over with as quickly as possible. Then, when I was in a relationship, I still didn’t make a big deal out of it because it sort of felt silly. But, over the years I have relaxed and can now enjoy it for what it is. It also makes a difference having a child. Every holiday seems so much more meaningful and fun when you have a little angel to celebrate it with. Our Valentine celebration this year had 2 parts to it: one with Isabella on a “date” while CJ and I went out and the other was Valentine’s day itself! 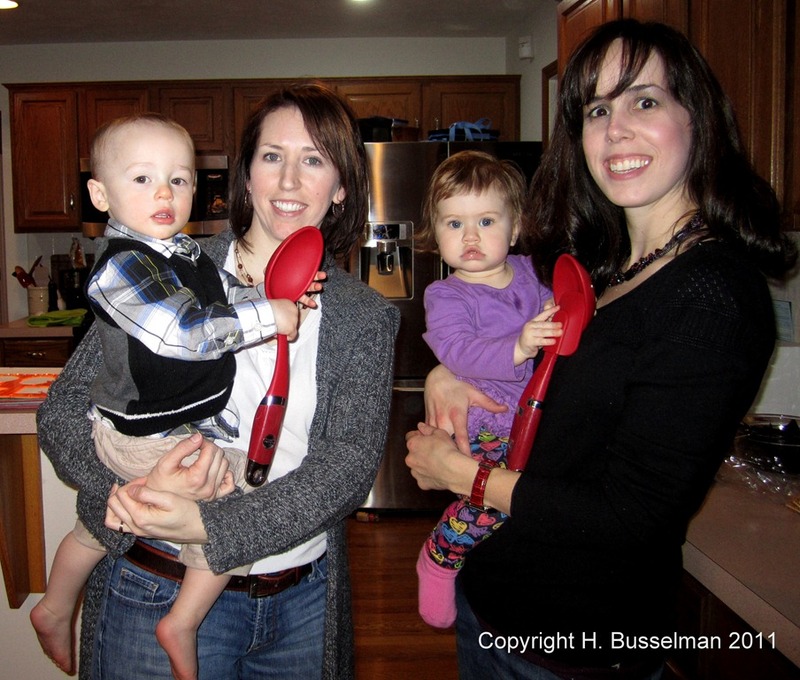 Last year, we celebrated Valentine’s with our friends Heather and Jeremy, and their son Owen, who is Isabella’s boyfriend. The parallels in our friendship are kind of spooky sometimes. Jeremy and I work together, Heather and I were pregnant at the same time, had the same due date, had doctors within the same clinic and we all go to the same Chiropractor. Weird, huh? It’s like it was meant to be! Owen ended up making his debut in to the world 5 days before Munchkin so technically she’s dating an older man. Like mother, like daughter! We had so much fun celebrating with them last year that we decided to do it again! Boy what a difference a year makes! 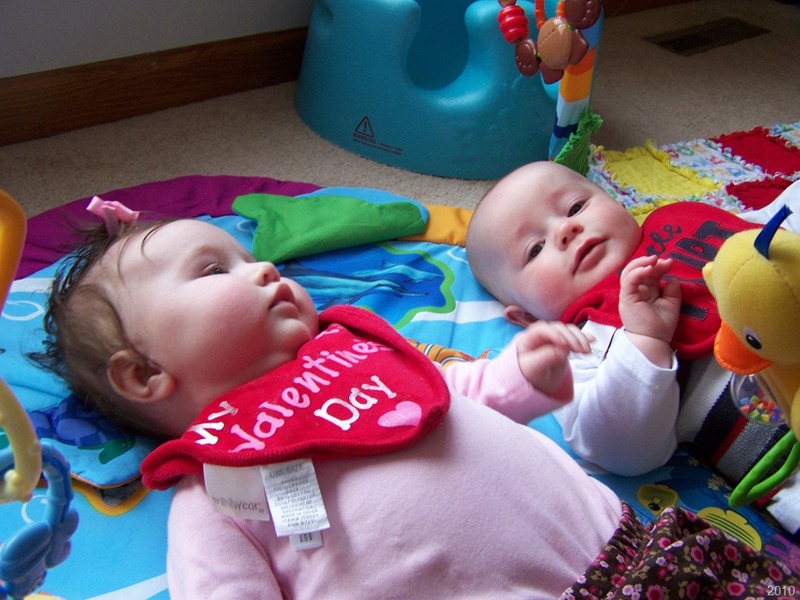 For Valentine’s 2010, the babies were almost 5 months old so they pretty much just laid around, rolling back and forth and batting at toys. This year was much different. They are almost 17 months now and both are super active. 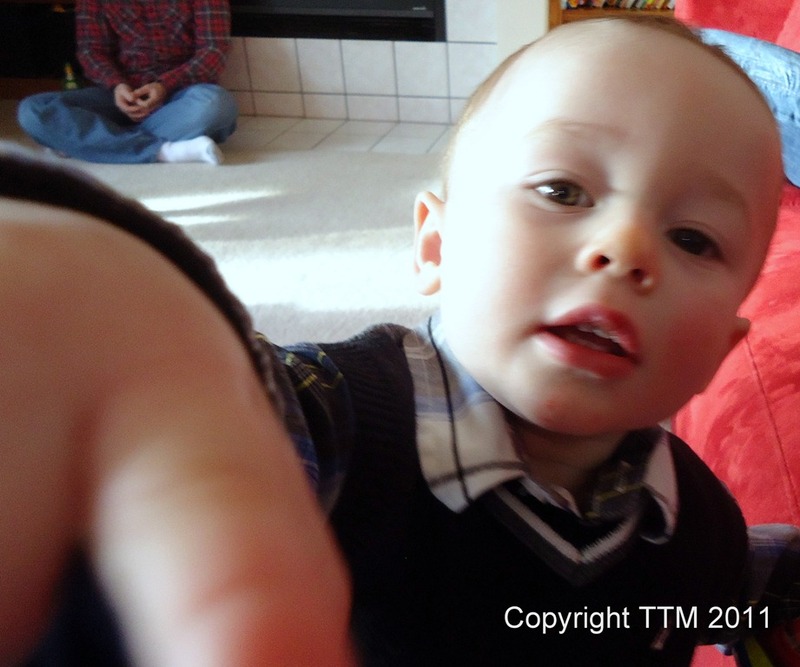 They were running all over the place, talking away, climbing on couches, throwing stuff, eating solid food and actually interacting with each other. 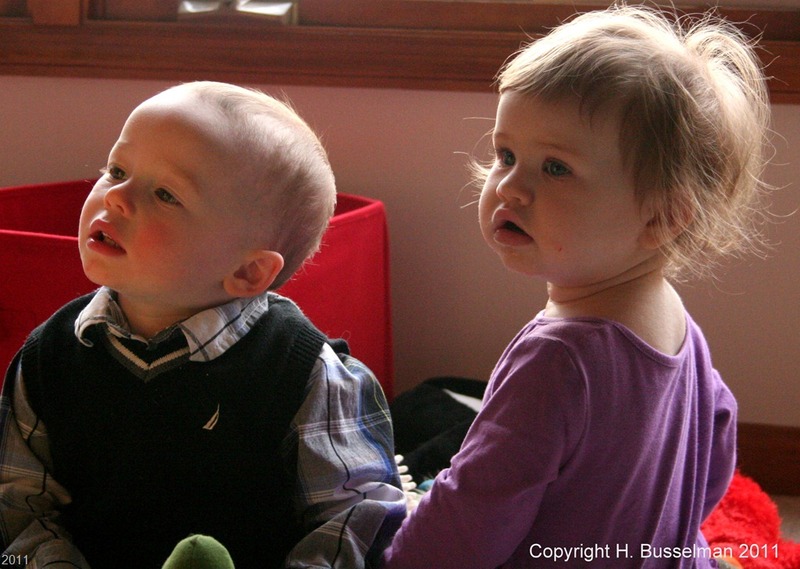 They are both such great kids and I think they will grow up to be good friends (at least that’s what I’m hoping). Think they’ve grown up at all? We got together on Saturday, to start the Valentine’s weekend off right! 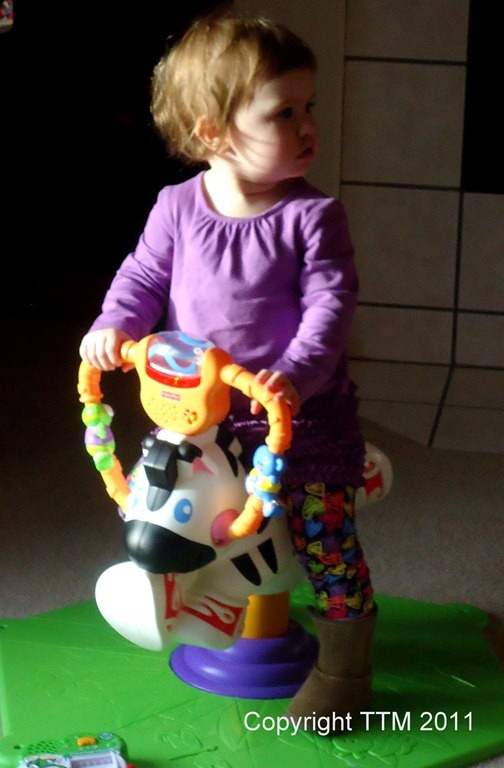 Isabella jumped right in and started playing with Owen’s toys – that’s the whole fun in being at someone else’s house! Owen had a lot of fun hanging out with us too. He really liked my necklace and camera! One thing that I think is really cool about our relationship is that Owen knows us and Isabella knows Heather and Jeremy, so neither kid is shy around the other set of parents. I’m glad because I want Owen to be comfortable around us and visa versa. The kids will basically run to whichever adult is closest when they needed something. Always fun to be a universal parent! 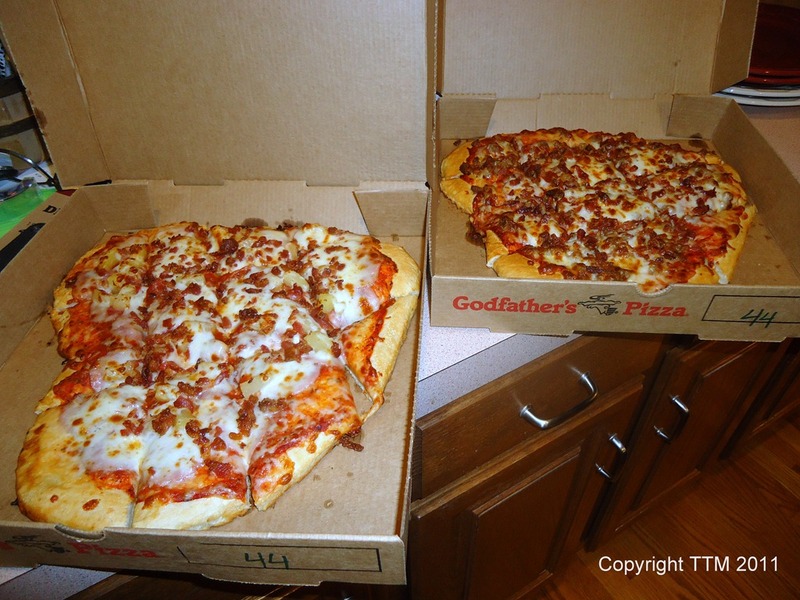 For dinner, we ordered heart shaped pizzas. Isabella gobbled hers up. I have to admit, it really hit the spot for me too. I think it tasted that much better because it was shaped like a heart – and because we were eating it with such good friends. We also had chocolate covered strawberries for dessert, because we’re fancy like that! Plus, calories don’t count when you’re celebrating with friends. Like, duh. After dinner, it was time for CJ and I to leave. We had tickets for a play so Munchkin was going to spend the night at Owen’s. It was her first non-family sleepover. I tell ya what, it never gets easier to say good-bye. We put on our coats and she hardly even noticed. She was playing away and giggling up a storm. I gave her a hug and kiss, which she quickly squirmed out of in order to get back to the toys. As we walked out the door, she came running up to it and pressed her face against the window. My heart started aching. I knew she was in good hands and would be totally fine once we left. But seeing her little face pressed up against the window was like a magnet pulling me back to her. CJ said, “Keep going and don’t look back.” So I blew her a kiss and walked away. 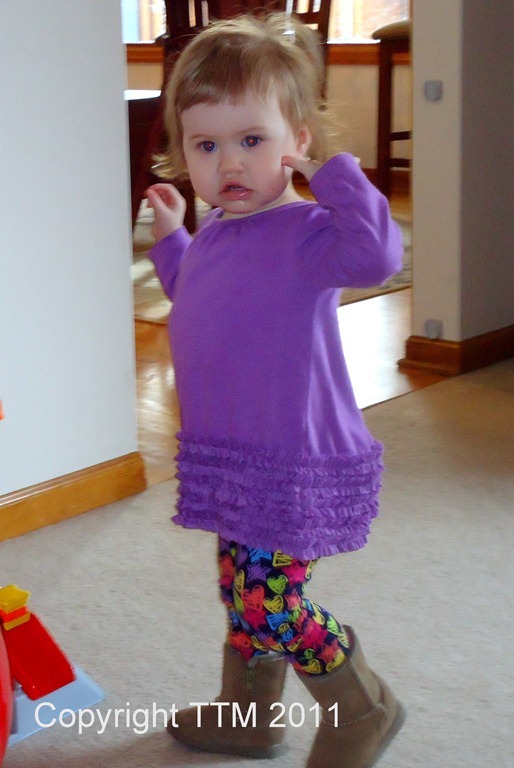 As I got to the driveway, I turned to look and saw her toddling off down the hallway, chasing after Owen. I knew then that she’d be perfectly fine and it made it easier to get in the car and drive away. Apparently, she did more than fine – she did great! 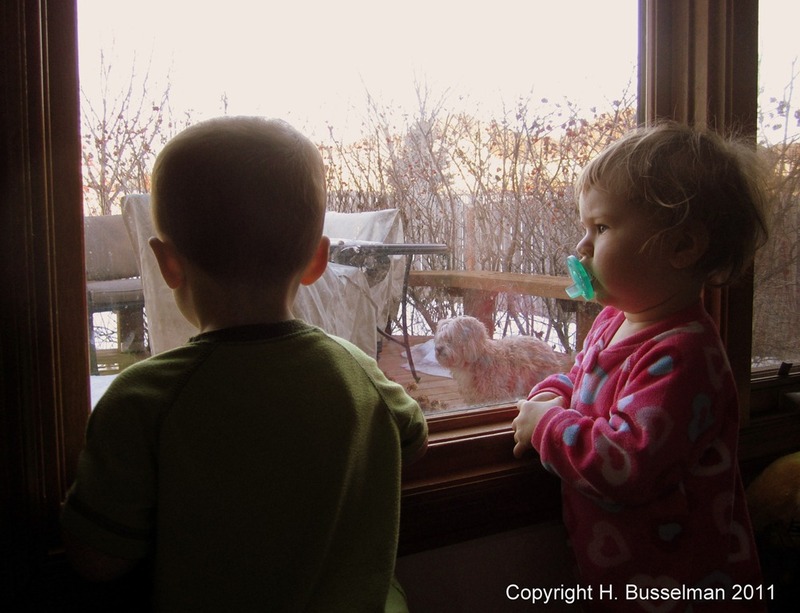 The kids got in their jammies and had some more playtime. They stopped for a bit to watch the puppies outside too. Looks like we might need to have “the talk” sooner than anticipated….plus Isabella still thinks her girl area is a “pocket”. 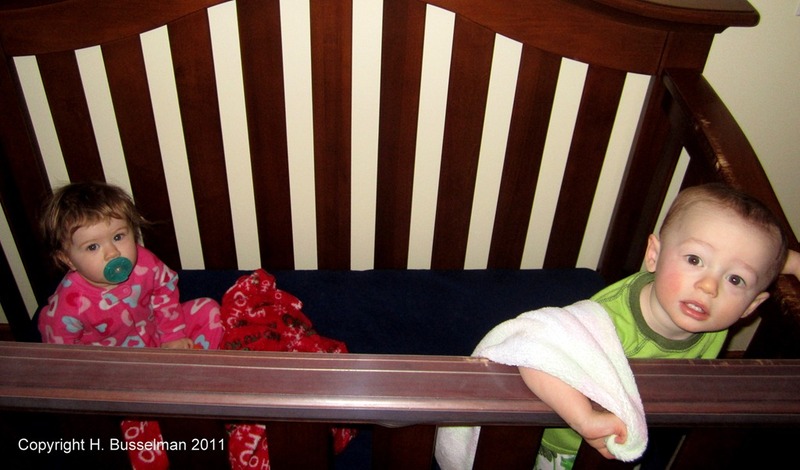 Both slept like a charm, which was good for Heather and Jeremy. I would have felt awful if Munchkin had kept them up crying for a woobie or something. The next morning, they woke up and had eggs for breakfast. 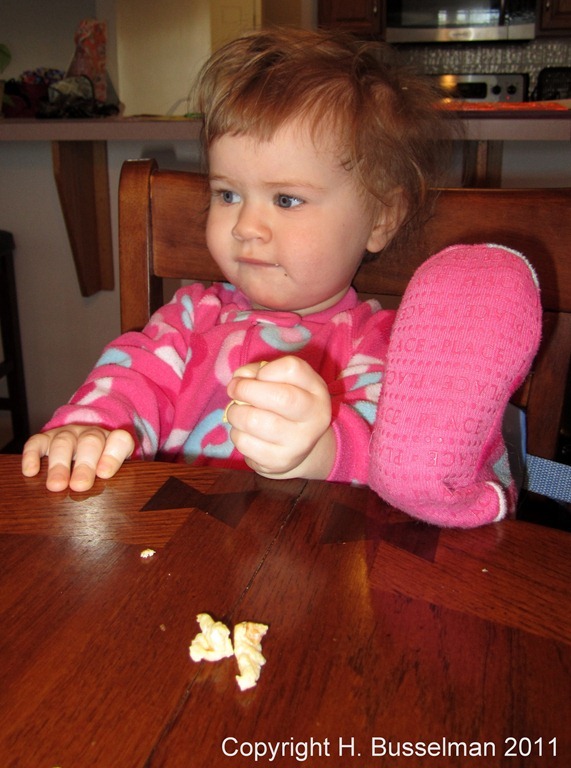 Muchkin needs a lesson in manners though as she thought it would be ok to eat with her feet on the table. We brought donuts with us when we came to pick up Isabella, so everyone had a second breakfast! 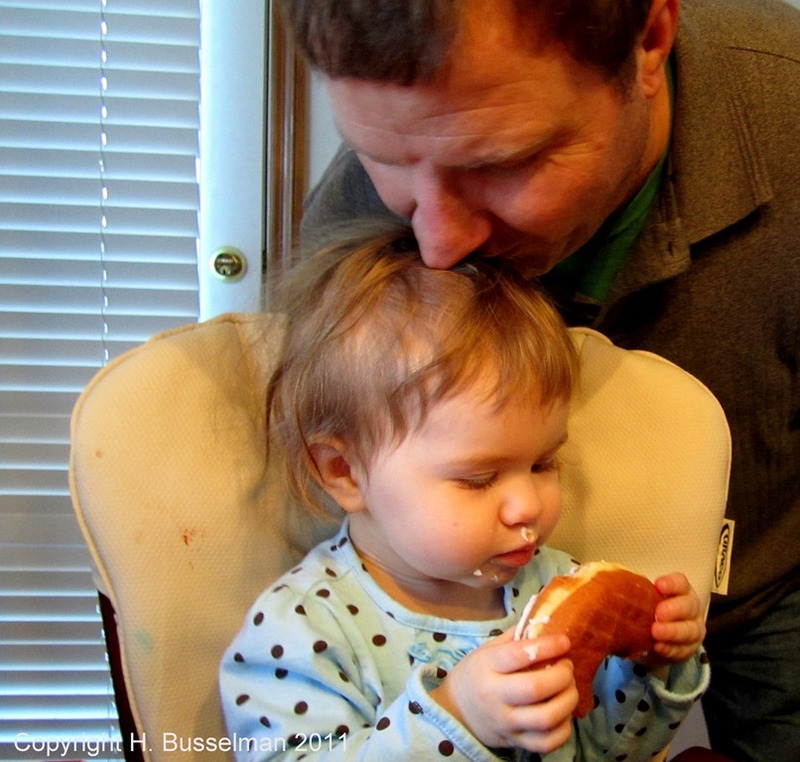 We were so happy to see our little girl and couldn’t stop kissing her, even while she ate her donut. It came time to say goodbye. At first, Owen seemed happy to let us leave – he ran down the hall to the front door and tried to open it! But then we realized he had such feelings of sadness in him, at the thought of letting his love go, that he acted out in the opposite way. Typical boys, right? They pull your hair when they want to hold your hand and kick you out the door when they really want you to stay! Eventually he relaxed and decided to say goodbye the proper way, with a kiss! All together now…awwwwwww! 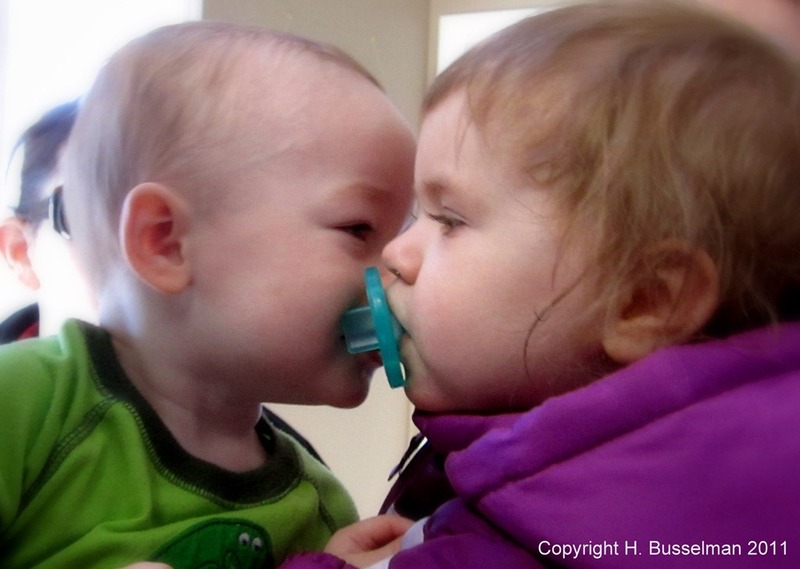 Good thing Isabella had her woobie in her mouth to keep that kiss from going further! It was a great start to the Valentine weekend and a big thanks to our friends Heather and Jeremy for being such great sitters! I feel totally comfortable having them watch her and I know she feels loved there too. Now, on to part 2! « Don’t Call me Late for Dinner! So cute! Looks like they had a lot of fun!